VICTORIA EUGENIE OF BATTENBURG Letter Signed. Queen of Spain, as wife of Alfonso XIII. Granddaughter of Queen Victoria. Letter in clerical court hand, signed with full autograph signature (as 'Victoria Eugenia'). Palace of Madrid. 31st January 1910. To Cardinal Pietro Coullie. 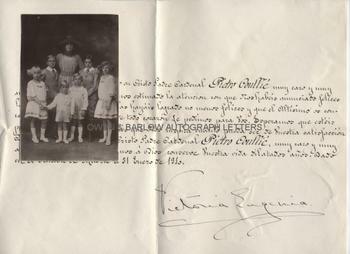 Together with a contemporary real photograph post-card showing Victoria Eugenie with her children. Text in Spanish. Apparently wishing the Cardinal well in his retirement and sending good wishes for a happy Easter and an enjoyable rest and expressing the hope that the Almighty grant him all the peace he could wish for and extended years of life, etc. Quarto. Approx 13 x 8.75 inches. Slightly trimmed at top edge, slight mounting traces to verso, else fine. The portrait of the Queen with six of her children is a real photograph post-card by Beagles and has the white border trimmed all round and mounting residue to verso. Alfonso XIII married Victoria Eugenie in 1906. She had been born at Balmoral Castle, daughter of Queen Victoria's daughter, Beatrice, and Prince Henry of Battenburg. Victoria Eugenie was first cousin to many European monarchs and future monarchs, including George V and the ill-fated Alexandra Feodorovna of Russia. Victoria Eugenie, known as 'Ena', was obliged to convert to Roman Catholicism in order to marry Alfonso XIII and consequently gave up her rights in the line of succession to the throne of Great Britain. She was the victim of an attempted assassination as she was returning to the Royal Palace in Madrid after the wedding ceremony and she subsequently became withdrawn and a little isolated from the Spanish people. When the couple's first child and heir to the throne was born, it was discovered that he had inherited haemophilia from Victoria Eugenie's side of the family and Alfonso is said never to have forgiven her for this circumstance.. The couple went on to have seven children, to whom she was a devoted mother. Alfonso XIII is said to have conducted numerous affairs, including an attempted seduction of 'Ena's' cousin, Beatrice, and the couple's relationship deteriorated. Victoria Eugenie subsequently threw her energies into work to improve social conditions in Spain, hospitals and education. She reorganised the Spanish Red Cross and did much to improve the health and education of the poor. After the declaration of General Franco's Spanish Republic in 1931, she went into exile with Alfonso XIII but the couple later separated. She was 'invited to leave' Great Britain, where she had been living for a time, and was also persona non grata in Italy, largely due to her Allied sympathies during the war. She eventually settled in Switzerland, where she died in 1969. Pierre-Hector Coullie (1829-1912) was a Roman Catholic Cardinal of Orleans.